Professor Zlatko Skrbis holds undergraduate degrees in philosophy and sociology of culture from the University of Ljubljana and a PhD in sociology from Flinders University. His research spans the areas of migration studies, social theory and life-course studies. He is the author of numerous papers which appeared in some of the key international journals. His recent books include Cosmopolitanism: Uses of the Idea (2013, with Woodward), The Sociology of Cosmopolitanism (2009, with Kendall and Woodward) and Constructing Singapore (2008, with Barr; Arabic translation in 2013). 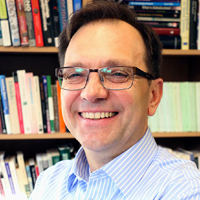 Zlatko is Vice-Provost (Graduate Education) at Monash University. His portfolio responsibilities include coursework and research graduate education onshore and offshore and the development of early career researchers. Before joining Monash in 2013, he was Dean of Graduate School at The University of Queensland. He was previously the convener of the Universities Australia Council of Deans and Directors of Graduate Research. He held prestigious fellowship appointments at The University of Warwick (2008) and The University of Manchester (2010). He is an Honorary Monash-Warwick Professor and Honorary Professor in Sociology at The University of Queensland.